In celebration of the 100th year of the National Park Service, I will post at least once a month in some way relating to our wonderful national park system to help bring awareness to an awesome part of our country that is so often under utilized. Many famous and well visited tourist sites in the US are classified under the national park system, however, most visitors don’t even realize it. Monuments, places of historical significance and battlefields are just some of the types of places you will find within the NPS. Many times, the most famous of the national park system’s sites are right in our own backyard, literally. There are a great deal of amazing national parks located in busy populated urban areas. The National Mall in Washington DC, the Gateway Arch in St Louis, Fort Sumter in South Carolina – all of these are in the national park system. Below a few family travel bloggers have shared their favorite family friendly sites located in urban areas. You might be surprised what all is included under the national park system. We love the urban parks because it means it’s even easier to support the NPS during our travels as well as more opportunities to earn new junior ranger badges! Gifted to the U.S. from France in the 1800s, the Statue of Liberty is perhaps the most iconic symbol of freedom and democracy in the world. Lady Liberty was designated a National Monument in 1924 and the copper statue has been managed by the National Parks Service since 1933. Located on Liberty Island in New York City the only way to reach this monument is via the Statue of Liberty – Ellis Island Ferry system. Be sure to purchase tickets in advance, especially if you’d like to ascend to the pedestal or all of the way to the crown of the Statue of Liberty. You can’t upgrade your ticket once there. If you aren’t sure, I recommend spending the extra bucks for the bigger adventure! Covering 20 city blocks right in the heart of Old City Philadelphia, Independence National Historical Park is a treasure trove for history buffs. Stand just feet away from where the Declaration of Independence was signed and read, visit Benjamin Franklin’s print shop, and take your picture with the Liberty Bell. When your kids get tired of the historical museums, stroll over to nearby Franklin Square, reputed to be where Franklin’s famous kite experiment took place. There’s a carousel, mini golf, and a large playground. Cabrillo National Monument, located just a few minutes from downtown San Diego in Point Loma, has a lot to offer families despite its simple name after the first European explorer to land on America’s western coast. Start at the Visitor’s Center to learn about the Spanish explorers. There are various interactive exhibits where kids can learn about the explorers’ lives on the ships plus armor and helmets to try on. Visitors can also touch bones of animals found around the area including whales. My kids’ favorite area are the rocky intertidal zone or the tide pools. Sandstone cliffs and layered rocks surround this area. Kids love observing the many creatures in the small pools or crevices that emerge during low tide. It’s a slippery walk among the rocks but a lot of fun. Visit Old Point Loma lighthouse where visitors can see how the rooms looked in the 1800s and climb the lighthouse. Bayside Trail is a 2.5 mile round-trip trail descending 300 feet into the coast passing by old war bunkers. If you’re visiting between December and March, go to the lookout by the gray whale sculpture to spot migrating whales. The park also holds some whale watching weekends with activities for families. Kids can earn their Junior Ranger badges here by completing some activities as they learn more about the park. This is a little known national park just outside of Los Angeles, near Malibu. It’s a beautiful park with a great number of activities for families throughout the year. Spend your day exploring the tide pools or bird watching at the famous beaches of Malibu or head inland to trek on more than 500 miles of trails. A favorite for our family is Paramount Ranch which is an old movie set still in tact. Kids love exploring the old buildings and pretending they are in their own wild west movie. There is also a Native American center to learn more about those who lived on this land long before us. In the summer, the park arranges campfires, guided nature walks and Jr Ranger programs at the main visitor center as well as throughout the park. The Santa Monica Mountains is just one of Los Angeles’s many hidden gems. Olympic National Park is our family’s favorite local destination. We live just outside of Seattle, Washington and have the park in our backyard. When we get out of town guests, we take them to Olympic National Park. When we’re bored, we go to Olympic National Park. It’s really our go-to local destination. Why is it so special? There are several features of the Park which encompasses the complete Olympic Mountain range: two different rainforests, an enormous alpine lake, and a series of pristine beaches, and incredible hiking above the treeline. It’s the most diverse National Park we’ve been to…and we’ve been to many. Our favorite activities are hiking Hurricane Ridge and exploring the Hoh rainforest. The Ridge has both mellow and steep hiking trails. You can either hike facing the Olympics and be awed by the jagged landscape or you can hike above the Strait of Juan de Fuca and gaze across the water to Canada. In the Hoh you encounter dripping mosses, algae in every stream, Roosevelt elk wandering through and a wide variety of mushrooms and toadstools growing year-round. It’s the gnome-like world of childhood stories, which is why the kids love it. It’s an easy day trip from Seattle or an investment of a few days if you’d like to experience all sides of the park. It’s worth the time to get there and you won’t be disappointed. If you’re headed to the Seattle area for a visit, Mt Rainier National Park is a must-see destination, with its close proximity to the city, around 2 hours away to either of the two main park entrances. There are 5 different regions of Mt Rainier National Park, with Paradise as the most popular destination for families due to the variety of trails for any age. The Alta Vista Trail is a paved, 1.2 mile stroller-friendly trail, offering beautiful views of the mountain & the picturesque Myrtle Falls. Families wanting a longer hike & incredible alpine views will enjoy the Skyline Trail, a 5 + mile trail if you do the full loop. The Sunrise location, only open in the summer, is a popular local spot & destination older kids would love with its abundance of wildflowers, frequent sightings of wildlife & unique views of Mt Rainier. Kids of all ages will love visiting this 14, 411 foot high mountain during any season. Summer is the most popular season with the gorgeous wildflowers and cascading waterfalls throughout the park. However, you can beat the crowds with a visit in the wintertime to enjoy fun in the snow with sledding or free, guided snowshoe hikes at Paradise for adults & kids 8 years old & up. Arches National Park near Moab, Utah, is my favorite national park to visit with children because it’s such a great place for playing “I Spy” — I spy arches, that is. The park has an incredible 2,000 natural arches in its sandstone rock, formed by erosion over millions of years. As we hike in the park, we keep our eyes peeled, calling out, “I see one!” around nearly every corner. 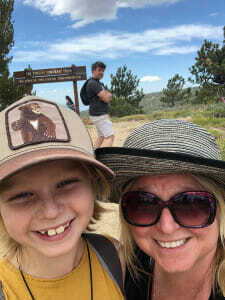 Indeed, hiking trails abound — from short nature walks for preschoolers, to longer, more rugged treks for teens.The 3-mile walk to famous Delicate Arch is great for school-aged children — a trail I highly recommend. Other highlights include a short marked trail to some ancient petroglyphs (rock art), and kids have fun spotting brightly colored lizards sunbathing on the rocks in Arches National Park. One of the largest national parks, the Everglades National Park is truly a magical place with its flat expanses and scenic beauty. The two best ways to approach the park are through either the Shark Valley entrance near Everglades City, or through the Ernest F. Coe Visitor Center, near Homestead and Florida City. The Shark Valley entrance is the most scenic and includes a 15-mile loop road that leads to a 65ft observation tower where you can enjoy breathtaking views of the park but if you have a limited amount of time the Ernest F. Coe Visitor Center is your best bet. Whether you are hiking, biking, canoeing, enjoying a tram tour or speeding on an airboat you will be sure to spot plenty of wildlife including alligators, turtles, wading birds and if you’re lucky you might even get a glimpse of a bobcat or even a Florida panther. Plan your trip during the dry or high season which spans from late November through May; the weather is cooler, there are less mosquitos and the water levels are low which attracts the wading birds and other wildlife. During the rainy or mosquito season most of the tour operators are closed, many hiking trails are flooded which will make it harder to see wildlife and the mosquitos and no-see-ums can really make a visit during these months miserable if you don’t take the proper precautions including applying copious amounts of mosquito repellent and wearing long sleeves and long pants. I was so excited about that I was spending my birthday in jail. It wasn’t just any jail. I was on my way to the most famous prison in the United States if not the world. Alcatraz Island is a small island in the San Francisco Bay. The island is famous for being a federal penitentiary. Over its 36 year history as a federal penitentiary, the island was home to some of the most infamous federal prisoners. The island became home for men such as Al Capone, Robert Stroud aka the Birdman, Machine Gun Kelly, and many more. The only way to visit the island is via the ferry. The island is now a nature preserve with a maintained historical building. There is a guided audio tour of the prison and several park service led events every day. The island is now home to a thriving breeding colony of birds. A fun fact is that 20% of the mice on the island are the color of concrete. This allows them to blend into all the concrete structures on the island. The Martin Luther King Jr. National Site is a great place for families to visit because it introduces children to the full legacy of Dr. Martin Luther King, Jr as not only a Civil Rights leader but also as a boy and father. This national park is actually collection of several different sites over two city blocks. Inside the Visitor Center is the “Children of Courage” exhibit, telling the story of the children of the Civil Rights Movement and how today’s children can keep the dream alive. There is full playground directly next to the Visitor Center for children to get out a little energy before going to the next stop on your tour. For young children, a favorite place is the Birth Home, where Dr. King lived until he was 12 years old. Inside the home, you see the games his family played with and his bedroom with the baseball bat on a ranger-led tour. The stories along the tour help children connect with Dr. King as a boy, similar to their ages. Part of the fun for this site is getting there with a trip on the Atlanta Streetcars that travel in a loop through the downtown area. If you drive, there is no charge for parking or to visit any of the sites. Do you have a favorite urban national park, monument or battlefield you would recommend? Share it with us in the comments! Excellent list! Another great urban national park to visit is Ohio’s Cuyahoga Valley National Park. The park is primarily historical and urban in nature, featuring pioneer farms and bicycle paths, with a lot of small but interesting natural areas, such as Brandywine Falls and The Ledges.